The key to successful, sustainable Lean implementation lies in the corporate mindset. At Four Principles, our approach is wholly collaborative – by working closely with your team we are able not only to address real issues which your organisation faces right now, but also to embed and nurture working practices that will endure into the future, paving the way for profitable, long term growth. At any new client we work with, there is an initial mix of scepticism and enthusiasm for Lean. 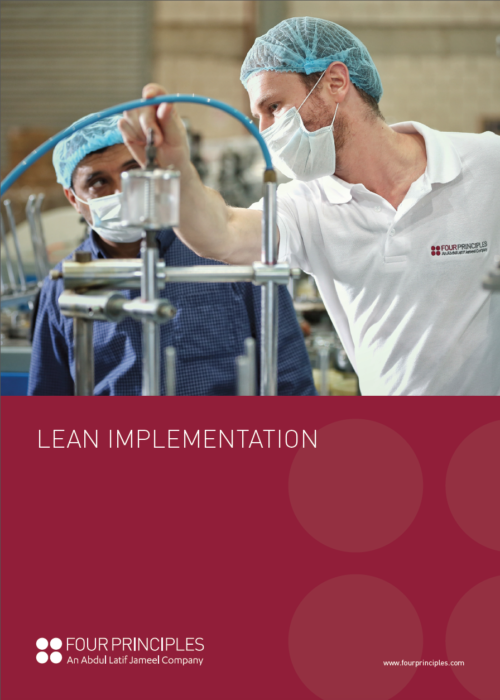 Applying Lean principles to eliminate waste and achieve sustainable cost reduction within problem areas of your workflow is a profoundly powerful tool. Firstly, this approach solves pressing concerns and achieves immediate gains. Secondly, the skills learnt by your workforce are implanted far more effectively than through the abstract theory of conventional “classroom” training. Thirdly, by delivering the irrefutable evidence of tangible, measurable results, our approach establishes “lighthouse” projects which act as beacons to the rest of your organisation. Even team members who were initially resistant to Lean become fully engaged and enthusiastic proponents of the philosophy, helping promote its benefits across your business. The first step towards this virtuous cycle of continuous improvement is understanding. This is why, at Four Principles, we invest a great deal of time in getting to know you, your organisation, your objectives and your challenges. By taking a holistic view of your business, we are able to diagnose the root causes of the key issues you face and design Lean interventions that address them. It is this synergy of our expertise and your intimate knowledge of your business that empowers Lean implementation by Four Principles.